By Wesley Fenlon on May 22, 2013 at 8:30 a.m.
A year after his first appearance at Maker Faire, Roy the Robot gets even more complicated, with 48 total servos controlling his arms, head and neck. 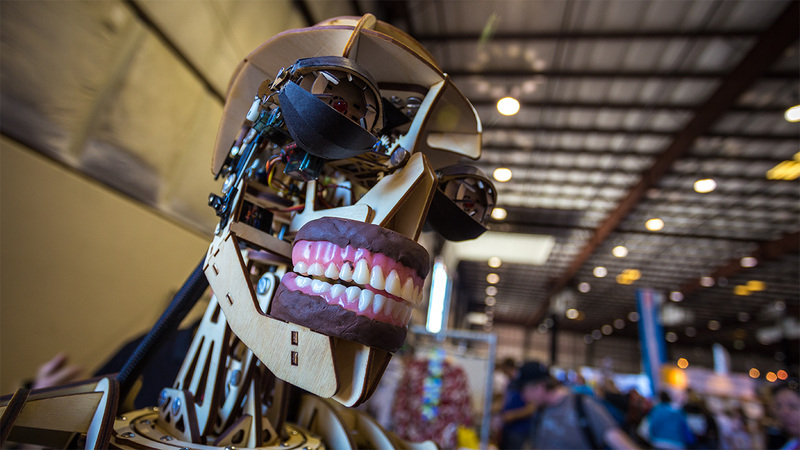 In 2012, Roy the Robot was one of the most eye-catching projects on exhibit in Maker Faire's expo hall. Half of Roy's draw came from his Terminator-like skeleton, with laser-cut wood standing in for shiny metal. He owed the rest of his appeal to a red Hawaiian shirt that Hunter S. Thompson and Bruce Campbell would've fought over. This year, the Hawaiian shirt hangs in the corner of Roy's booth, because he's no longer wearing it--he's got a brand new laser-cut chest to show off. 11 months after concluding a successful Kickstarter, maker Brian Roe is drawing a constant crowd to show off the new and improved Roy. 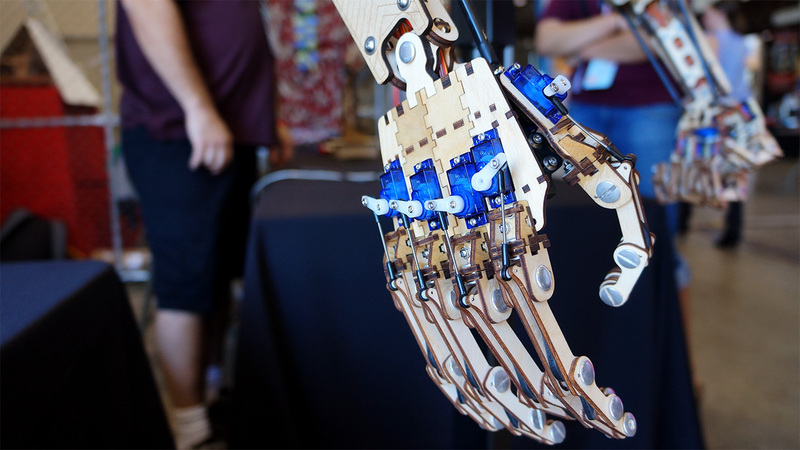 "At Maker Faire last year I had the arm and the hand and just the head, basically, the eyes and the jaw," says Roe, who's a mechanical engineer by day. "It was all mounted on a PVC frame kind of representing the shape of a human body, but nothing underneath the shirt. That's why he had a Hawaiian shirt on. I wanted to cover up all the PVC. This year I decided I really wanted to try to finish out the arms. So I got working on the arms, but then of course, if you're going to build the arms, they have to attach to something. So then you need the chest. Well, if I'm going to put the chest in there, I might as well do a cool neck because I've got the chest there to hook the neck to. So it got a little crazy. Now he sits with 48 servos, 16 servos in each arm. It's crazy. There's a ton of servos." Roe started Roy as an animatronics project before Maker Faire 2012. The scale of the robot quickly spun out of control, but in a good way--Roe kept adding degrees of articulation, laser cutting parts in his home workshop, and suddenly his robot had a hand with individually servo-driven fingers. 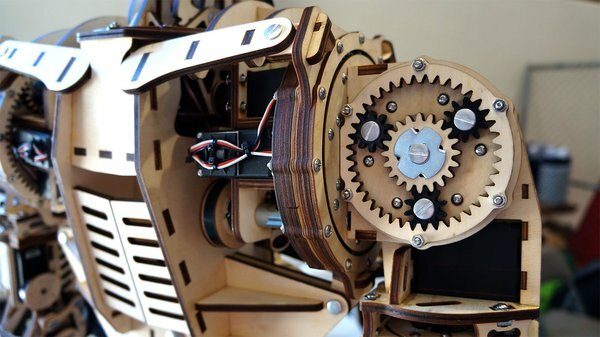 Roe launched a Kickstarter the first day of Maker Faire in 2012, offering Roy arm kits for backers to assemble, and eventually raised about $15,000--double his goal of $8,000. There was enough money and interest in the project for Roy the Robot to grow even more complicated. But first, Roe had to deal with laser cutting some 10,000 parts for his backers. "By the time it was all said and done I had to make about 75 arm kits for the Kickstarter," he says. 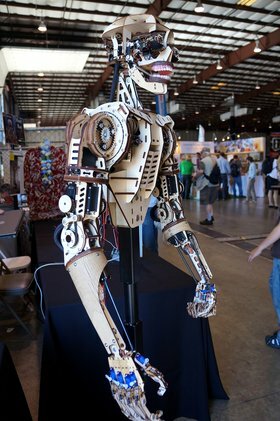 "Each of these arm kits has about 150 laser cut parts and probably 200 screws...It took me eight months of every single day, 2-3 hours every night, to pull off the project. The cutting of parts alone was mind-boggling. Everything was laser cut. The cutter ran for hours on end. You don't realize how many parts it is when you have to make 75 of something and there's 150 parts. And just the organization, keeping all those parts separated, and organized, and packing, and making sure you've got all the right screws. There must be 30 different types of screws just in the arm. So they all have to be separated. Just the instructions, I probably spent a week shooting videos and writing text documents on how to build one of these things cause they're so complicated. It was completely overwhelming." The end result was a gratifying positive response. Roe discovered that many of his backers were father-son teams who assembled Roy's arm together. And thanks to the Kickstarter, he now has an easy way to reach them if and when he decides to start selling kits for Roy's other parts. After shipping the last of his Kickstarted arm kits, Roe got to work on finishing Roy's arms and eventually built his shoulders, chest and neck in time for Maker Faire 2013. Unfortunately, he didn't have time to wire all of Roy's 48 servos into a control circuit. "I have the Maker curse and I took on more than I could accomplish," Roe says. "Here this year at MakerFaire it's all assembled, it's all working, but I didn't get a chance to hook it all up and get it wired. So currently each individual servo I can plug in and move one axis, but it isn't all tied to a control system. I'm very bummed." Roe demonstrates moving one of the robot's arms, and it's obvious that the whole animatronic will be seriously impressive when fingers, elbows, shoulders, neck, eyes and mouth will be moving in harmony. But that's going to be a major challenge for Roe, since he's a mechanical engineer with little electronics experience. When he started the project, he mostly picked out parts by searching Internet forums and figuring out what people recommended. That's how he found the animation software that brings Roy to life. He currently uses software called Visual Show Automation to animate Roy's movements, but he has to keyframe each individual servo. Imagine setting keyframes for 48 different servos for every single animation sequence. That's a little much. "My hope is to eventually get a Waldo or puppeteering system that I can puppeteer him and record that and tweak it in the visual and save that," Roe says. "As I puppeteer it the computer would be recording it. Then I could pull it up as waveforms of each servo, and then I could go in and tweak each channel if it didn't hit exactly where I wanted it. You get the general gross movement of everything and then dial it in by hand." 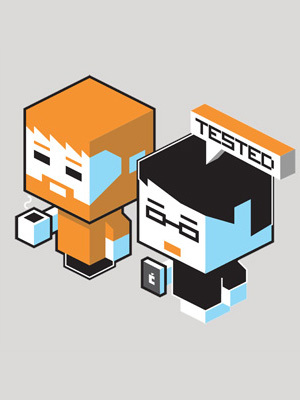 Roe also hopes to team up with an electronics expert at some point to fine tune Roy's movements. 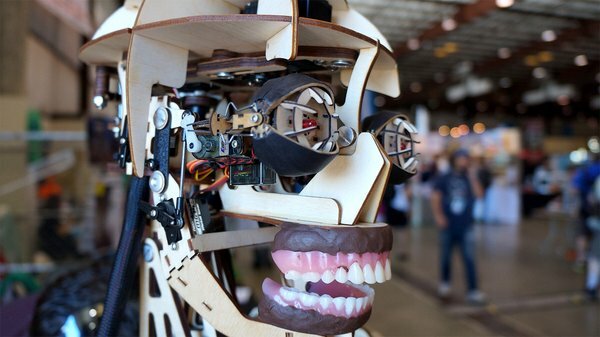 The project's a long way from over--Roe still plans to build an entire animatronic robot, from head to toe, and to sell affordable kits to people so that they can build Roys of their own. By next year, the robot may be built out to the waist and have a spine to call his own. Brian Roe currently sells the kit he Kickstarted on RoytheRobot.com. $300 nets you Roy's hand and forearm.